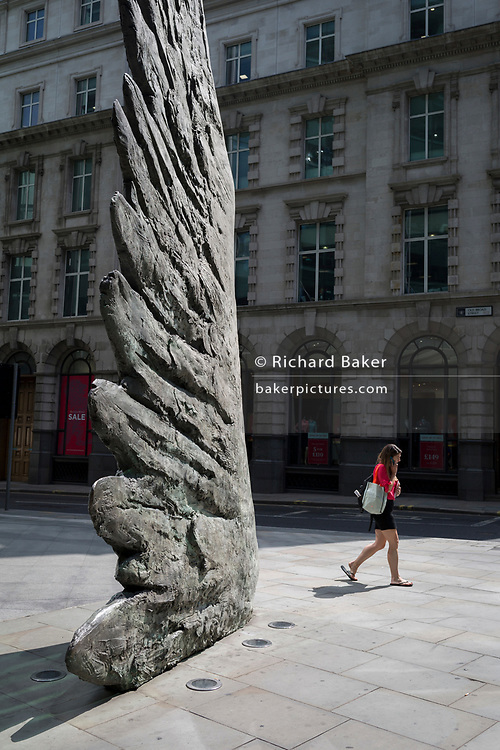 Londoners walk past the sculpture entitled City Wing on Threadneedle Street in the City of London, the capital's financial district, on 25th July 2018, in London, England. City Wing is by the artist Christopher Le Brun. The ten-metre-tall bronze sculpture is by President of the Royal Academy of Arts, Christopher Le Brun, commissioned by Hammerson in 2009. It is called ‘The City Wing’ and has been cast by Morris Singer Art Founders, reputedly the oldest fine art foundry in the world.